Dairy; something that many include in their diet, but is it good for you? There are those who choose to cut it out, or have to, due to lactose-intolerance or allergy who have difficulty digesting dairy products. Whatever the reason, there are many health benefits in choosing dairy-alternatives and making the lifestyle change. Cutting out dairy can actually help you lose weight. Milk has a substantial amount of excess saturated fats, sugar and salt in it, which obviously aren’t great for you in large amounts. Not eating dairy, and therefore having lower saturated fat, sugar and salt intakes will promote weight-loss due to a lower calorie count – depending on what you eat alongside the dairy-alternatives, of course. The fats and cholesterol in dairy products can also cause bloating, with many unable to digest it at all without discomfort and therefore being lactose-intolerant or similar. The gut doesn’t process dairy too well for anyone, intolerant or not, creating discomfort and swelling of some degree and therefore causing a bloated appearance and feel to your stomach. Going for dairy-alternatives will lessen the bloating you experience, making it easier to achieve that ‘summer body’, or whatever you’re aiming for. Many people choose to keep dairy in their diet because of the calcium it provides. But with the calcium come the saturated fats, sugar and cholesterol, making the calcium in the milk seem less valuable. Physician, author and vegan Dr. Michael Greger notes that only 31% of calcium from milk is absorbed by the body, whereas in other calcium-rich foods like sesame seeds, 60-70% of the calcium is absorbed. 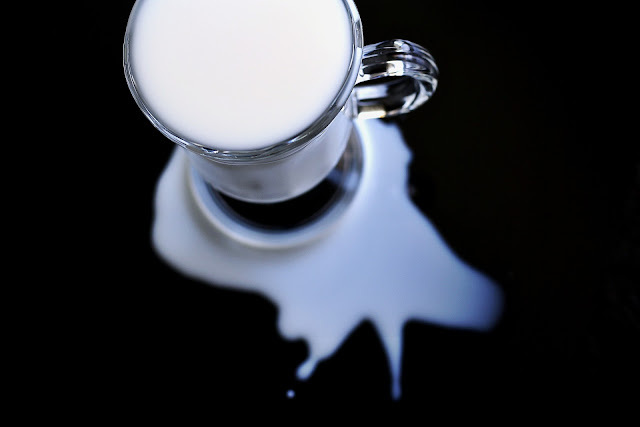 “More milk was associated with more fractures, higher rates of cancer, heart disease, and a higher total mortality -- meaning they lived shorter lives.” When wanting to get your calcium, reach for sesame seeds, almonds, or greens like broccoli, kale and watercress – these foods also provide a good amount of fibre that your body is most likely lacking. For those who suffer with sensitive or irritated skin, perhaps those with eczema or psoriasis, cutting out dairy could be beneficial. According to Pure, opting for almond, soya or oat milks will provide the skin with a youthful glow and rid it of itchiness and dryness. Making the lifestyle-change to go dairy-free seems daunting, and above all, difficult. However there are so many products on the market to substitute into your diet to cut the dairy. Vegan.com provides advice on how to switch out dairy-foods for alternatives. Some of the options include choosing soy, almond or coconut milk for a healthier option to add to your cereal or coffee, with lower fat content and additional health benefits. Vegan cheeses, ice-cream, yoghurts and mayonnaise’s are also available in most retailers, with more and more varieties always coming into shops. Those are just some of the benefits of cutting out dairy If you’re like me and wouldn’t dream of giving up cheese (it’s a guilty-pleasure), you could consider swapping out a few dairy products to still get some benefits, without sacrificing your love for some of your favourite ingredients. There’s also lots of dairy-free cookbooks available to educate further and give ideas and inspiration for delicious, dairy-free meals.